I'm happy to find that for you but in future, you can search for an image on google up uploading it on the toolbar, when you select image. Neurotypicals have 10x more powerful Broca's Area. So neurotypicals have better social skills as mimicry, interaction and communication. And also better motor skills as object grasping and manipulation. Then Aspergers are more awkward, clumsy and eccentric, have poor social context comprehension and are less influenced by social environment. However Aspergers have 10x more powerful brain's Brodmann areas related with visual-spatial intelligence. That's why Aspergers score higher on Raven's Progressive Matrices IQ tests. And why Aspergers can catch details with higher resolution. An advantage to achieve more in areas such as Engineering, Design, Architecture, Physics and Math. I'm happy to find that for you but in future, you can search for an image on google up uploading it on the toolbar, when you select image. The picture is based on a Research done by Dr. Walter Schneider from Pittsburgh University. https://commons.wikimedia.org/wiki/File:Asperger_vs_normal_brain.jpg Neurotypicals have 10x more powerful Broca's Area. So neurotypicals have better social skills as mimicry, interaction and communication. And also better motor skills as object grasping and manipulation. Then Aspergers are more awkward, clumsy and eccentric, have poor social context comprehension and are less influenced by social environment. However Aspergers have 10x more powerful brain's Brodmann areas related with visual-spatial intelligence. That's why Aspergers score higher on Raven's Progressive Matrices IQ tests. 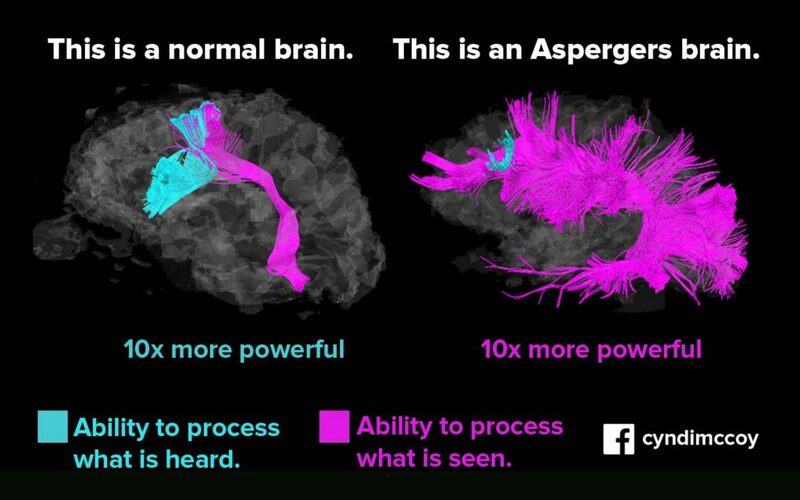 And why Aspergers can catch details with higher resolution. An advantage to achieve more in areas such as Engineering, Design, Architecture, Physics and Math. This is good. I just wanted to read up if you had an article.